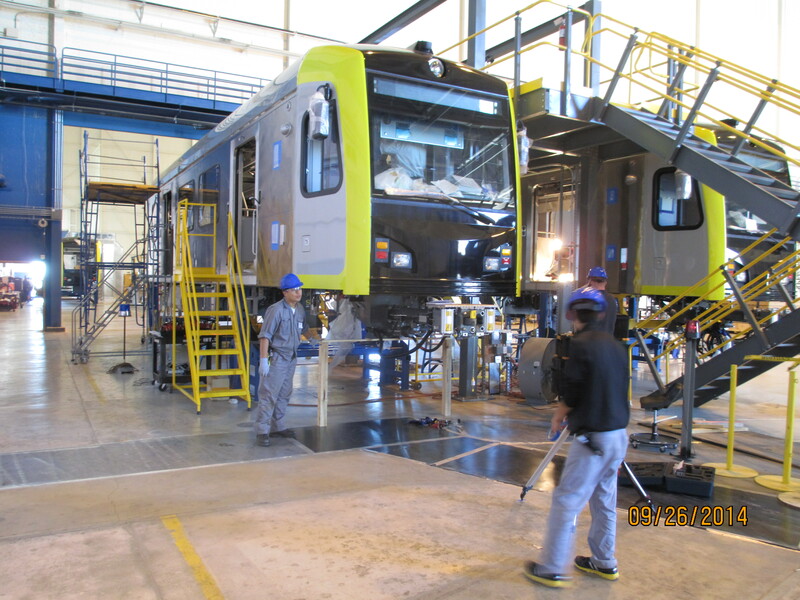 A light rail car being assembled in Palmdale in September at Kinkisharyo’s facility. Photo by Metro. LOS ANGELES – Los Angeles Mayor and L.A. County Metropolitan Transportation Authority (Metro) Chair Eric Garcetti today announced that an agreement has been reached between Kinkisharyo International, LLC and labor and community groups to resolve an impasse that would have seen the company locate manufacturing operations for its next order of Metro light rail cars outside of L.A. County. Mayor Garcetti intervened to continue stalled talks among the parties, resulting in the agreement. As a result of the agreement, Kinkisharyo will expand the current light rail car assembly and testing operations at its existing site in Palmdale to include manufacturing tasks, which will create up to a total of 250 jobs. The 175 cars being worked on at the facility will be put into service on the Crenshaw, Exposition and extended Gold lines. The agreement includes a neutrality agreement, as well as a commitment to explore additional skills training and assistance for disadvantaged L.A. County workers. Over the last month, negotiations took place via separate and joint meetings with both sides, conference calls and night and day sessions in the Mayor’s office, with the company and labor and community groups each at times stationed in separate conference rooms and the Mayor’s staff going back and forth to broker the deal. Mayor Garcetti directly participated in the negotiations in person and via telephone. “Los Angeles County voters have a high standard for public projects. Taxpayer-funded projects should benefit workers and residents. With this settlement, all sides are honoring Measure R’s promise of increased public transit and good, clean jobs in LA,” said Maria Elena Durazo, Executive Secretary-Treasurer of the Los Angeles County Federation of Labor, AFL-CIO. Currently, Kinkisharyo is assembling and testing 78 light rail cars at its Palmdale facility under a 2012 Metro contract. Under this agreement, the present facility will be expanded to perform additional manufacturing tasks and employ up to 250 people to fulfill an order for 97 additional cars, and it will do similar work on future orders as well. Kinkisharyo International, LLC is the U.S. subsidiary of Kinki Sharyo Corporation of Osaka, Japan. The parent company has a nearly 100-year history of producing top quality rail cars ranging from streetcars to the famed Shinkansen bullet trains. In the U.S., Kinkisharyo International has established an unparalleled reputation for quality and on-time delivery and has produced hundreds of light rail vehicles for communities throughout the United States, including Boston, Jersey City, Santa Clara, Dallas, Phoenix and Seattle. The company is headquartered in El Segundo, California. Organized more than 100 years ago, IBEW 11 is one of the largest and most progressive IBEW locals in the country. They represent more than 11,000 construction electricians and L.A. City municipal workers. The IBEW’s cause is human rights, human justice and human security. Marvin Kropke is a 36-year member of the IBEW and has been the business manager since 1997. Jobs to Move America is a national coalition uniting more than 40 community, labor, faith, civil rights, philanthropic, academic and environmental groups to make our transit dollars go the distance. Members of the Jobs to Move America coalition, which includes LAANE, IBEW local union 11, the Los Angeles County Federation of Labor AFL-CIO and others, is dedicated to ensuring that the billions of public dollars spent on public transit systems create better results for our communities: good jobs, cleaner equipment and more opportunity for low income people. LAANE is a leading advocacy organization dedicated to building a new economy for all. Combining dynamic research, innovative public policy and the organizing of broad alliances, LAANE promotes a new economic approach based on good jobs, thriving communities and a healthy environment. So the Metro cars will get built in Palmdale, but what about K-S’s plan for a more permanent plant? That’s lost now right? Would be nice if this facility could expand to include the new heavy rail vehicles. If this plant is working making cars for LA (both light and heavy), hopefully other US transit agencies will give this plant their “Made in America” credit. And if it starts to get busier, maybe Kinkisharyo move more of the manufacturing here. There is no mention of the environmentnal document that I seem to recall the union made a big deal of a month ago…. Above it states that “Labor and community groups settled a public records act lawsuit and agreed that all environmental challenges are now moot”, so apparently that situation has been settled. Above it states that “Labor and community groups settled a public records act lawsuit and agreed that all environmental challenges are now moot”, so apparently that situation has been resolved. My comment was meant to be sarcasm, as in they never really cared about the environmental stuff. Because as with all games, it was never about the environmental document! I believe that it refers to being pro or anti union. Previously they had an anti-union stance.